Until its closure in 2003 and subsequent removal, this was something of a rare survival, as an unaltered iron chapel, formerly a gospel hall, of the late C19 or early C20. 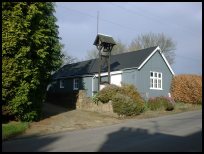 It was originally one of two chapels, along with Horam, in the parish of Waldron and later served an outlying hamlet in the newly separated parish of Horam. Its walls of painted corrugated iron had domestic-style windows. The purpose of the building was indicated by a free-standing open-work timber belfry near the east end, consisting of two posts that supported an over-sized roof to protect the bell.